Born/lived: Born in Giverny, France where her father Edmund Greacen was an impressionist painter. Known: Actively following Claude Monet, Nan Greacen became a noted oil painter and watercolorist. Studied: Brearley School in New York City and then studied for four years at the Grand Central Art School, which her father had established in 1921. Her instructors were Wayman Adams, Arshile Gorky, Jerry Farnsworth and her father. 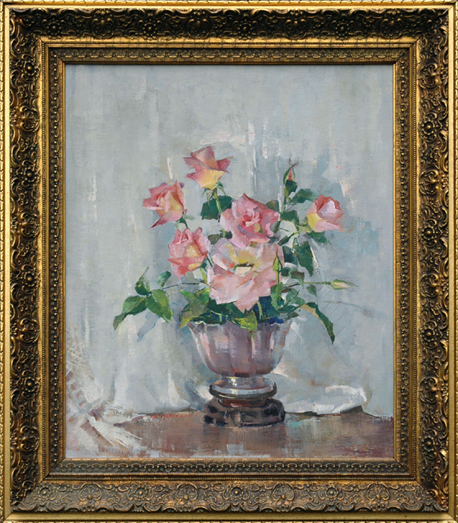 Member: She was a member of The National Academy of Design, Audubon Artists, Allied Artists of America, Hudson Valley Art Association, Florida Water Color Society and Jacksonville Water Color Society. Exhibited: Her one-woman exhibitions include Grand Central Art Gallery, 1967; Daytona Beach Art Gallery, 1969; and Florida Gulf Coast Art Center, 1972-1974. Awards: She began earning awards from 1936, when she received the Hallgarten Prize at the National Academy of Design. In the following years, her award medals were from the National Arts Club, Montclair Art Museum, Katherine Lorillard Wolfe, Hudson Valley Art Association, and Grumbacher Society. Taught: She taught drawing and still life at the Grand Central Art School from 1931 to 1942, and from 1942 to 1968, gave private classes at Ponte Vedra Beach, Florida where she had moved with her husband, Rene Bard Faure. Publications: She also wrote and illustrated two books on painting technique: Still Life is Exciting (1965) and The Magic of Flower Painting (1971). Artist Last Name Greacen, N.A.